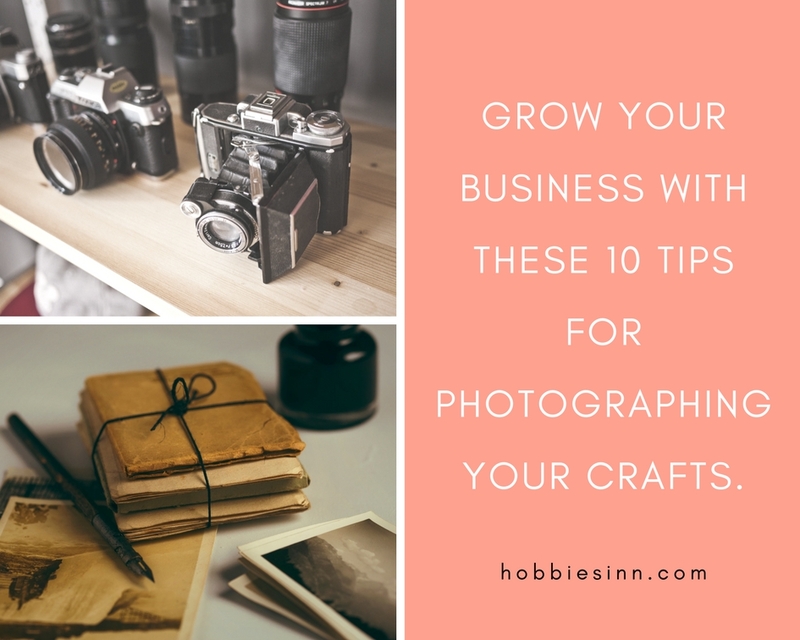 Grow Your Business With These 10 Tips For Photographing Your Crafts. Your photographs represent your brand. Yes you are creative, you are talented and you can have a beautiful business growth. But if you are not putting you best foot forward in photographing your handmade treasures you are harming your business more than you are doing good. A beautiful picture has a greater impact on the minds of your prospecting customers. Your pictures speak volumes of how efficient you are. A bad picture may put off a person and a good picture will earn you benefits. You may wonder that you are not a photographer and do not have a great camera or props to style your pictures, worry not! I have compiled some tips for my lovely readers for photographing their crafts. I have picked up these tricks over the years of my blogging and have figured out what works best. The natural sunlight is best for any picture to stand out. I do not mean to picture your item in scorching sun but use the natural light. Natural sunlight will always give you best photo no matter what camera you use. Indoor pictures with artificial and dim lights may put yellow cast on the picture or may make look your product look lifeless. The colors too don’t look good. Again I don’t say the item has to be in sun, in direct sun too the picture will look less appeling. You got to be indirect. As long as natural light is hitting your item, you are in good position to capture a beautiful picture. I actually take most of my photos for use here on the blog and in my crochet patterns on the floor of our verandah. Work with what you’ve got, I say! 3. Use lights if needed. If you are working late in night and cant photograph in sunlight than you can use a lighting kit or the light in the room must be very bright so that picture will look good. Dim light will make your picture look bad. Also the source of light must not be angled at any position and no shadows must be cast on the item. 4. Photograph with more than one camera. If you can, and if you have then why not experiment with various cameras and make sure which one works best. Whatever works good, use that. Never be satisfied with just one picture. Always take multiple shots in different angles and positions at varying distances. Sometimes the photos I end up using in a blog post or on my Pinterest account are the photos I thought wouldn’t turn out well at all. You do take many selfies before you are satisfied with one so why not with your product. Remember it speaks volumes about your business. Backdrops or backgrounds are essential for any picture to stand out. You don’t need any fancy charms or ornaments. Use what you have. Keep your background simple and minimal. Don’t overcrowd with things that may deviate the attention from the subject. If you can’t purchase a professional backdrop than you can always use a white sheet, your marble or wood flooring. Or maybe a simple cement surface. All looks good with good light and good angle. Don’t use colorful and patterned surfaces of quilts or blanket. How you stage (place) your items makes all the difference. For example, if you are selling a jewelry than take picture while wearing them but take care of your messy hair and make sure you look good. selling crochet mitts? Take pictures while wearing them and while not. Do try to make a difference. See how they ( big giant bloggers and crafters) do it. Take inspiration from there. Try to showcase all aspects of your product. Color, size, style etc. When you take a picture of your product, use any good props like flowers, leaves, charms etc that will make your picture look better. But don’t overdo it. For example if you are selling a blanket, drape it around a chair. Put a coffee cup near it or some magazines may be. The look and feel will make people feel good about it. 9. Use a free online/offline photo editing tool. Use any free online or offline photo editing tool. You can use photoshop if you are well versed with technology. Otherwise picas works fine for offline editing. Canva or picmoney are best online editing tools. Play store too offers various photo editing tools. You can adjust brightness, contrast, shadows and highlights in these editing tools. Just don’t use any dramatic effects as a professional doesn’t do that. Don’t unnecessarily blur or vignette your pictures. That is for kids, you know! I can not stress the importance of using a watermark or at least adding your name to the photos you post online. If you make gorgeous items (which of course you do!) those images will be shared. Once they are, it is out of your control. At least give people seeing it a way to find you if they see that shared photo on Facebook. Canva has a great text tool that you can fade out to create a watermark on your photos – and for free! If i have missed any tip, kindly mention in comments. I hope this piece of article was helful to you.